This week, we conclude our look at past celebrations by noting that not all of them involving people occurred here. 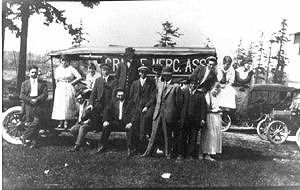 This group of residents was on a 1916 outing to Steele Lake, which is now in what is known as Federal Way. The truck’s banner indicates that they are representing the Grange Mercantile Association. Appearing in the photograph are (from left) William Pickering, Hazel Bush, and unidentified man, Orpha Lyne, Elmer Becker, Roy Pickering, Del Darst, Pete Erickson, two unidentified men, Art Tibbetts, Floyd Bush, Gladys Peterson, and Agnes Bush.